Duraphat Toothpaste is a type of medicinal toothpaste prescribed to people who are at high risk of severe tooth decay. Tooth decay is sometimes known as caries, and Duraphat is prescribed to adults and adolescents over 16 years old who are at risk of multiple caries. Tooth decay can occur at any age due to poor diet or poor dental hygiene. It can lead to both cosmetic issue, such as yellowing teeth and rot, and physical pain from toothache. Duraphat can help prevent the spread of decay, even once it has begun, by rebuilding the tooth’s enamel. If you need to use Duraphat Toothpaste, you can buy it online safely from a UK doctor such as Doctor-4-U by completing our simple medical questionnaire and getting a certified prescription. It will be dispatched within 24 hours. .
Duraphat Toothpaste is prescribed to those who are at risk of serious long term damage to their teeth caused by decay and rot. This may seem like merely a cosmetic issue, but it can lead to damage to the gums, and serious pain as the problem spreads and you get older. Although prevention is always better than cure, the active ingredient Duraphat Toothpaste will help to rebuild damaged enamel, even if there is already some decay. You need a prescription from a GMC/EU certified doctor in order to buy this medication online. To buy Duraphat Toothpaste from Doctor-4-U, simply complete our online consultation and if you are deemed suitable, we will dispatch your medication usually within 24 hours. If you are not deemed suitable for Duraphat Toothpaste, you will receive a full refund. Do you need a prescription for Duraphat Toothpaste? Yes, you need a prescription from a GMC/EU certified doctor in order to buy Duraphat Toothpaste online. With Doctor-4-U’s easy consultation process, you can get a prescription for Duraphat Toothpaste safely and quickly. Select the item you want to buy, click “Start Consultation” and fill out the short medical questionnaire provided. If you are deemed suitable for your prescription, it will usually be dispatched within 24 hours. If not, you will receive a full refund. How does Duraphat Toothpaste work? 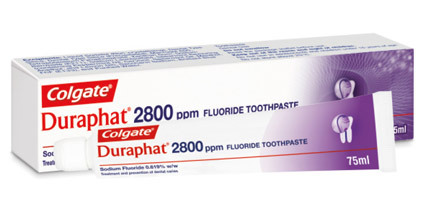 Duraphat contains the active ingredient sodium fluoride, which belongs to a family of medicines called caries preventive agents. Sodium fluoride protects teeth against decay by rebuilding the tooth’s enamel, which can be worn away by acids in the mouth. It can also help to rebuild enamel, where the damage and decay has already begun. Good dental hygiene is the best way to prevent tooth decay. Is Duraphat Toothpaste suitable for me? Although Duraphat is designed for those suffering from tooth decay, your medical history may mean it isn’t right for you. What are the side effects of using Duraphat Toothpaste? Like all medications, Duraphat may have side effects, but not everyone gets them. There is a very rare risk of an allergic reaction occuring, characterised by swelling of the face and hands, and a difficulty in breathing. Contact your doctor immediately if you believe this is the case. Duraphat toothpaste should be used once a day, once in the morning and once at night. Use a 2cm ribbon of toothpaste on your brush, and brush your teeth thoroughly for three minutes. Do not swallow the toothpaste, spit it out. Brush TWICE daily, spit only do not rinse, leave toothpaste on teeth. Avoid sugary foods.